(Fox News) The word is out that the Cubans have advance teams on the ground in Syria in preparation for deployments of Cuban Army armored infantry units who will support the Iranian Kuds Force, Russian Naval Infantry and Russian Army units. I'm sure that Raul Castro cleared it with his new best friend, Barack Obama. From Fox (cited above) Gen. Leopoldo Cintra Frias, head of Cuba's Armed Forces, recently visited Syria to lead a group of Cuban military personnel joining forces with Russia in their support of Assad, according to information received by the University of Miami's Institute for Cuban and Cuban-American Studies. 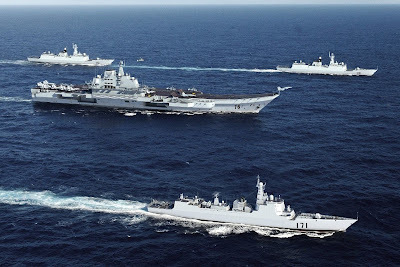 The Chinese People's Liberation Army's Navy aircraft carrier battle group centered on the Liaoning (formerly Varyag) is expected to depart within the month to join their Russian allies off the Syrian littorals in support of whatever operations the Russians decide to undertake. It's all fun and games with Barack Obama serving as US President and the game of kick me can be played with no consequences. In fact, Obama feels that the Russians, Chinese and Cubans are his friends. There is no word of North Korea joining in the circle jerk, but I wouldn't be surprised if they sent troops as well. From Fox (cited above) The U.S. official described Cuban's involved in Syria as similar to the "Cuba-Angola arrangement" -- a reference to Cuban troops operating on behalf of the Soviets in several central African countries in the 1970's. Cuba also sent troops to Syria in 1973 to support them in the Yom Kippur War against Israel and deployed officers to observe Israeli military tactics.